I’ve been playing Clash Royale a lot since installing it on my phone more than two months ago and I love it. The card battling mechanics are really solid, and the real-time element makes playing the game an experience that I’ve never had with other CCGs (collectible card games) before. But I’ve come to realize that it has several flaws, some of which can be really frustrating. One such issue that I have with the game right now is how the game’s mechanics for progression can stifle innovation – let me get into this in detail. Clash Royale has two ways to measure player progression – King (or Player) Level and Arena. King Level is your own player level and is based on the amount of experience points that you gain from achievements, card upgrades, and donations. The durability and damage output of your towers is dependent on your King Level. Arena is based on your trophy count, and trophies are gained/lost per win/loss. There are nine different Arenas as of this writing, with each separated by a specific trophy range. When you start a regular battle, you get matched up against someone with a similar trophy count – this ensures that match ups are determined not just by King Level but also by skill. When you start playing Clash Royale, you won’t have access to all the cards in the game – you have to unlock them by getting them in chests, and chests are marked based on which Arena you earned them in. Each Arena has a set of cards assigned to it and you can only get cards from that Arena or lower from your chests (e.g. an Arena 3 chest would only contain cards from Arenas 1 through 3). When you start your Clash Royale profile, you can only get these cards. You’ll have the chance to unlock more with each new Arena that you move up to. Just on this aspect, the game already pushes you to move up in Arenas before you can really be creative with deck construction because you won’t have access to the entire card pool – if you have all the cards from Arenas 1-3, you only have 53% of the cards in the game. I understand the logic behind this – locking access to certain cards allows players to be eased into the different cards and not get drowned by all the possible combinations. Aside from having more card options, chests from higher Arenas have better rewards – more Gold and more cards, and a higher chance to get some of the harder to get Epics and Legendaries. Again, I understand this – you want to offer better rewards for players who are doing better at the game to motivate them to be competitive. Each chest type will contain more cards and Gold as you move up in Arenas. Here’s the problem though – winning in Clash Royale involves more than just skill. I mentioned Gold and upgrading cards, right? Clash Royale has a card upgrade system which allows players to “level up” their cards into more powerful versions. Upgrading a card requires having a certain number of duplicate copies of that card and spending a certain amount of gold, and the requirements go up the higher the level of the card. I like the upgrade system. It makes a lot of sense for this game because the card pool is very small. But when you get to certain levels (around 9 for Commons and 7 for Rares), upgrades become almost exponentially harder. I have the entire table below, but to upgrade a Common card from Level 8 to Level 9 you need to have 400 copies of it and you’ll spend 4,000 Gold. For Rares, upgrading from Level 6 to Level 7 requires 100 copies of it and 4,000 Gold too. Upgrading your cards to really high levels require a lot of Gold and duplicates of that card. However, chests contain random cards, so the best way to upgrade your cards is through card requests. (Note: The game has a card shop but it only carries a few cards selected randomly and it can cost a lot of Gold to buy multiple copies there). Every 8 hours, you can request for cards from your clan. 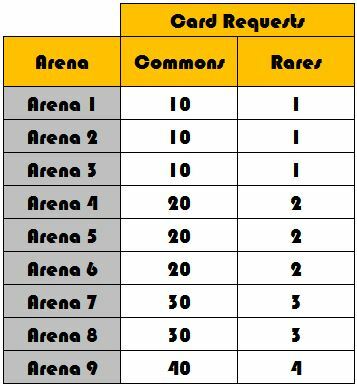 The number of cards that you can ask for depends on whether you’re asking for a Rare or a Common card, and it also depends on what Arena you’re in. That’s right – being in higher Arenas will essentially make it easier for you to upgrade your cards. I have the entire table below, but let me talk about a specific example that I myself experienced. I was so desperate to get to and stay in Arena 7 because I could request for 30 Commons or 3 Rares at a time. That’s 30 more Commons and 3 more Rares per day compared to being in Arena 6 where I could only ask for 20 Commons and 2 Rares at a time. Another way to illustrate this: it would take me 4-5 days to upgrade a Common card from Level 8 to 9 through card requests if I were in Arena 7; it’ll take me 6-7 days of card requests if I were in Arena 6. Being in a higher Arena will give you the ability to ask for more cards from your clan. Moving to higher Arenas will offer better (and more) rewards, and upgrading cards will require a lot of cards and Gold. What does this have to do with being able to innovate? In lower Arenas early on, when card levels don’t matter as much, your card pool is limited so you won’t be able to discover a lot of the possible combinations. 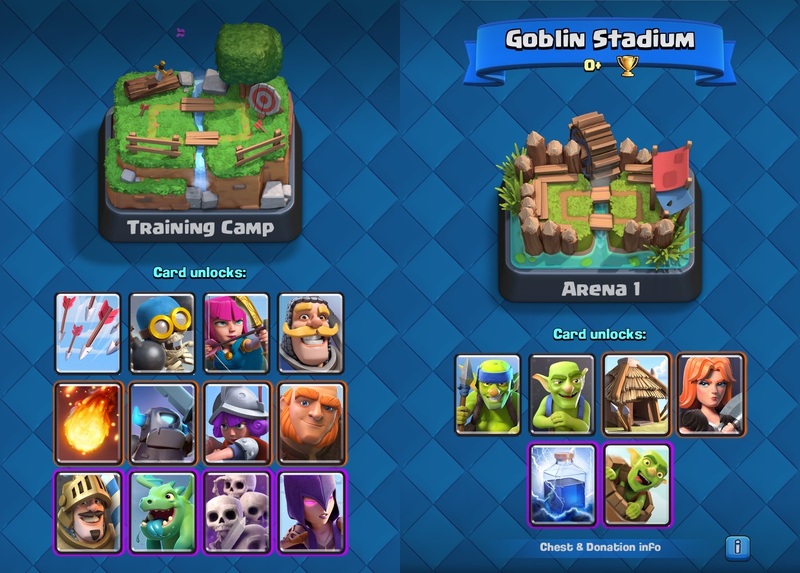 At some point (around Arena 4 and 5), you’ll need to start upgrading your cards to be able to compete against the field. By the time you get to Arena 6, you’ll have access to most of the card pool but you’ll also be forced to focus your upgrades on a limited number of cards due to the increasing upgrade requirements. Here’s what happened to me: when I was in Arena 5, I started using what’s known to the Clash Royale community as the Hog Trifecta deck. I was then faced with the option of sticking with this deck and make a push towards the higher Arenas, or to stay where I was and discover a deck of my own design that worked well enough to be competitive. I tried the latter but I wasn’t satisfied as I kept facing opponents with higher upgrade levels. And based on this experience, I can say that you’ll never see how truly effective your cards are unless they’re of the same level as what your opposition has. Simply put, I needed to upgrade the cards that I wanted to test to competitive levels. But because of the better rewards and significant difference in the number of cards that I could request for between Arena 6 and 7, I was forced to choose the more optimal option – move up. So rather than tweaking the deck that worked well for me, I just stuck with it. Even then, it was hard for me to hang around in Arena 7. It wasn’t until I upgraded my Rares and Commons to the tournament standard levels (Level 7 and 9 respectively) that I was able to be competitive enough not to drop to Arena 6. This issue with the game may turn some CCG veterans off of Clash Royale. But like I said above, I understand the mechanics that are causing this problem and I agree with the reasons why these mechanics are in place. I don’t think anything in the game needs to be fixed. But I think that anyone who is playing or wants to play Clash Royale for the deck building aspects of CCGs should be aware of this issue. Whether you choose to prioritize progression or innovation, both choices will require patience. I have to admit, this almost made me quit the game altogether. But I didn’t. After more than a month of playing the Trifecta deck and upgrading the cards in it, I’m finally able to stay in Arena 7. Actually, I’m currently in Arena 8, but I don’t mind dropping to 7 because it won’t affect my card request limits. Now, I can finally put my resources in upgrading and testing other cards. Have you played Clash Royale? Did you experience the same problem? Let us know what you think by leaving a comment or two below! I have stuck to the same cards since day 1 and they win maybe 30% of the time, which is enough to progress in my lazy way! But lately the lack of Princes and Skeleton Hordes have really hurt me… I have not collected a single card in weeks! I am about a quarter of the way with my other cards to lv10! Great game, but horribly frustrating at times and the long wait times between chest rewarding matches needs filling, sorry tourneys I have heard are fun but the stress if trying to get in turns CR decidedly into a NOT casual game! Thanks for the comment! My clan isn’t as active as I’d like it to be, but I’m getting enough donations so I’m okay (currently requesting for Zaps). I’d invite you but you might get disappointed. The struggle to get Epics and Legendaries is real. After I had the Rares and Commons in my deck upgraded to tournament standard levels, it feels like I hit a wall that’s blocking me from progressing. Oh well, patience is a virtue. Very tall. But as long as you know what to expect and you have the patience needed, you’ll be okay.